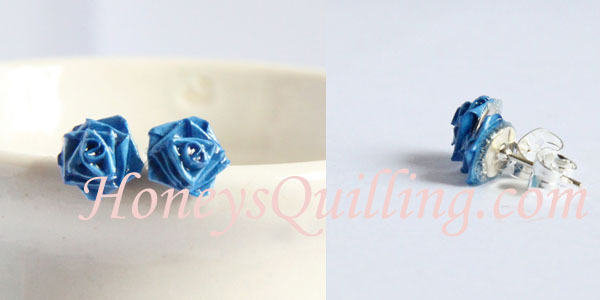 Just over a week ago I posted a tutorial on how to make TINY paper quilled roses. 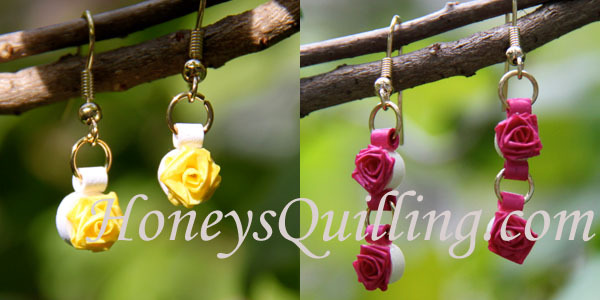 These tiny roses are good for all sorts of fun crafts like cardmaking, frames, gift tags, etc. But what I love to use them for most is jewelry! Today I’m going to show you how to turn them into some fun little dangle earrings and show you some more styles I’ve used them for. 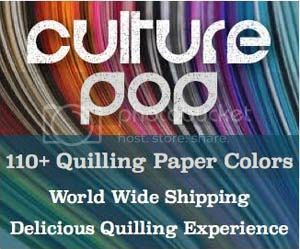 Are you new to paper quilling? Check out THIS post for beginners info! glue – my favorite is PPA which you can find here on Amazon . 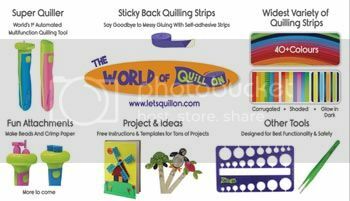 (click here to see some posts I’ve written about glue for quilling). Start by rolling your 1 1/2″ strips into little solid roll . You can use a needle tool or toothpick and stick it into the middle of your solid roll so there is no bent paper center in it. So for each rose “bead” you are going to have two little roses and one little solid roll. Dab a fairly generous bit of glue onto the back of one of the roses (not a LOT of glue, but more than you would generally for quilling). Glue the two roses back to back as shown. 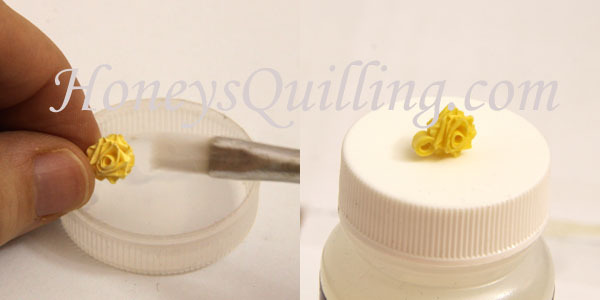 Then with another dab of glue, add the solid roll to one side as shown below. Now it’s time to add sealant to your rose “beads”! You can use any sealant you wish, click here to view all of the posts I have about sealants. Dab the sealant on with a brush on all sides (you may want to hold your rose with a tweezers to avoid getting your fingers messy). Then dab any excess sealant with a tissue and lay your rose on a plastic surface to dry. You will want to check it frequently in the first few minutes to dab any excess that is dripping down, or else it’ll leave a big flat shiny spot one the side touching the surface. Once your paper rose beads are dry, it’s time to assemble! Open your jump ring, poke it through the solid roll on your rose bead, and then slip on the earring hook. Close your jump ring. That’s it! If you wish to add another coat of sealant, you can do that now and then hang the earrings to dry. For this project, I used earring hooks and jump rings from this kit which was sent to me for use and review by PandaHall.com. I will be sharing some more of the supplies they sent to me in upcoming posts. Some fun stuff! So far the quality seems good, your average jewelry supply stuff. But some of the supplies are things I haven’t tried before, so I’m having fun experimenting and will share soon! 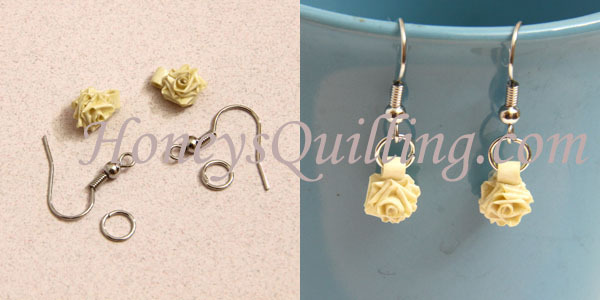 First, here are a couple photos of my first style of tiny rose earrings. I used to make a solid roll and glue the rose onto it. But soon I started making the new style, with two tiny roses glued back to back. Much better! Looking for something even more simple? 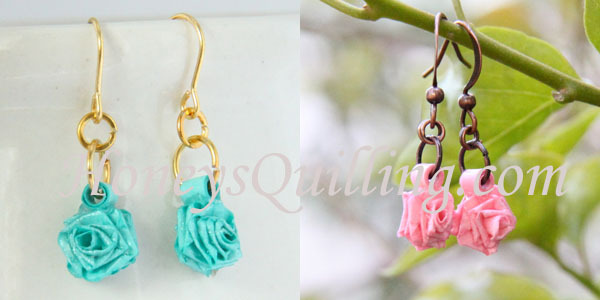 Just glue a tiny rose to an earring post! When you do this style, first make the paper rose, then glue it to the post, and THEN dip it in sealant. Do NOT first put sealant and then glue it onto the post. I found that it glued much more securely BEFORE applying sealant. A double dangle rose chain earring, and a necklace and post earring set. For the necklace I glued together three roses and then glued a back layer of paper on as well to make it more sturdy. Now coming to the chandelier earrings, some of my favorites! 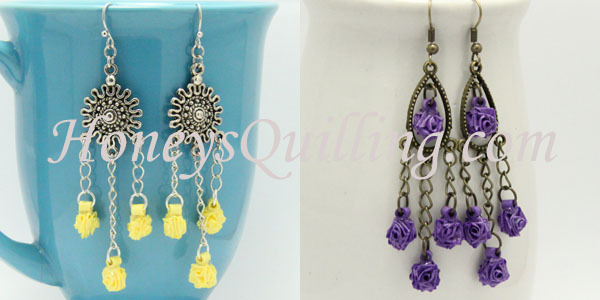 There are so many fun chandelier earring findings that you can choose from. You’ll notice that for the yellow ones I glued the solid rolls sideways, while with the purple pair I glued them front to back. You can do it either way, sometimes it just depends on your design. Beautiful pink chandelier! 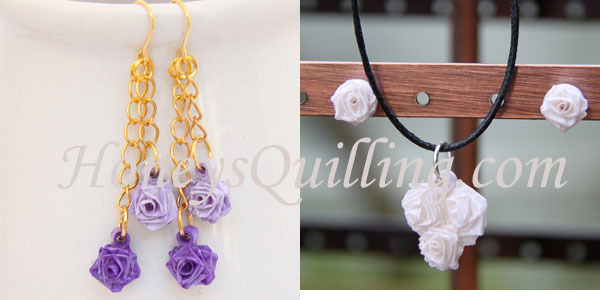 With these fun multi layer chains of roses, you’ll need to plan ahead. Some of your roses will need to have solid rolls glued on the top AND bottom, but some won’t. So make your plan for how many of each you need before you add sealant! 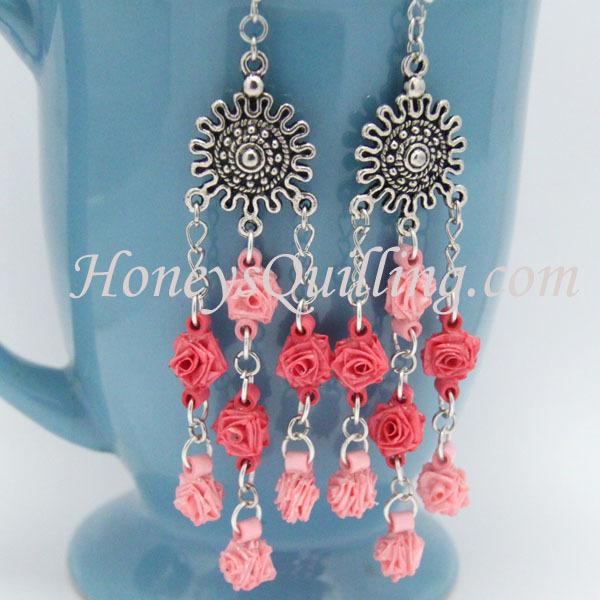 And my favorite, the red rose chandelier earrings! I just love these! Don’t stop with just earrings! This cute rose pin is a fun design. I used a metal pin that had a plastic pad on it to glue the roses to. Makes a fun and bright addition to a coat, purse, etc. I hope you enjoyed this tutorial! Let me know if you try it, and feel free to share a link if you shared your creations based on this tutorial on your own blog. But don’t leave yet, lots to see here! *The jump rings and earring hooks used in this post were sent to me from Panda Hall. All opinions are my own. All other products and supplies in this post I purchased and/or made on my own. awsome but it would be good if i had an oppertuanity to see your vedio. Thank you for your comment 🙂 Yes, videos is definitely something I want to add in the future!